Our June dinner ride on Tuesday the 26th @ 6:30 pm. and will be at “Native Grill and Wings,” 10255 E. Old Vail Rd. The menu is the link for Native Grill and Wings. Our May breakfast ride will be on Saturday May 12th and we will meet at the Hungry Fox Restaurant & Country Store, 4637 E. Broadway. Meeting time is 08:00. For those of you who may not have been here they are not only a restaurant but they have a large selection of country items for sale. Click on the link to find out more. Our May dinner ride will be on Tuesday May 29th and we will meet at Brother John’s, 1801 S. Stone @ 18:30 hrs. Our April breakfast ride will be on Saturday April 14th @ 8:00. Now that the weather is getting warmer we will return to 8:00 a.m. breakfast times. We will meet at Sunny Daze Café 4980 S. Campbell Ave. Hope to see you there. Our monthly dinner ride will at Ole Mexican Grill, 2080 W Orange Grove Rd. on Tuesday April 24th. Meeting time is 18:30. Hope to see you there. Our March dinner ride will be at Claim Jumper, 3761 E. Broadway, 795-2900. We will meet on Tuesday March 27th @ 6:30 p.m. as usual. 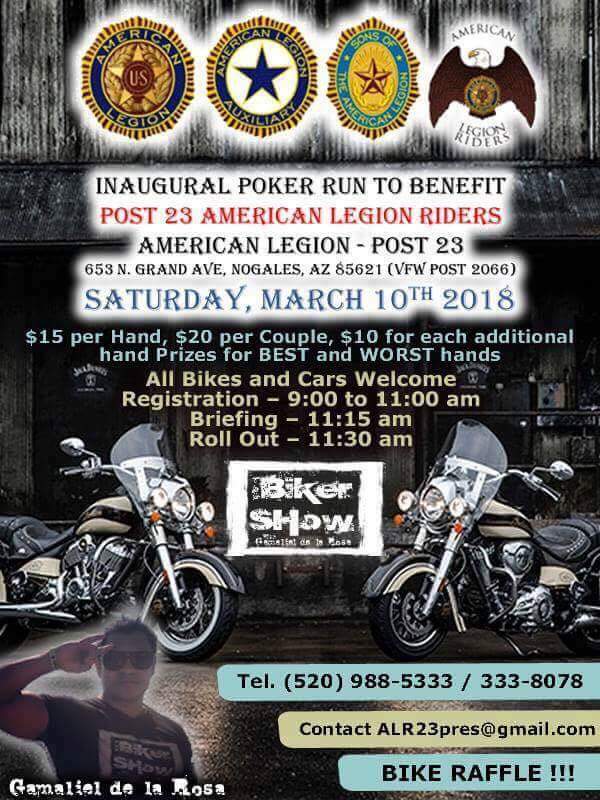 Our March Breakfast ride will be on Saturday the 10th at the Arizona Family Restaurant in Green Valley. 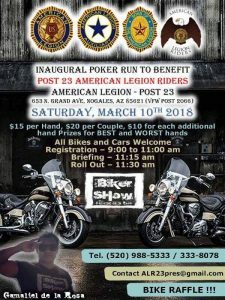 We will meet this month @ 8:30 because after breakfast there is a Poker Run in Nogales sponsored by the American Legion Post. Registration is from 9:00 – 11:00 so we should be able to make it there after breakfast.